С Е М И Н А Р Ы и М Е Р О П Р И Я Т И Я по И А И Д О. Even if I see one man's mistake, I mustn't go against him. 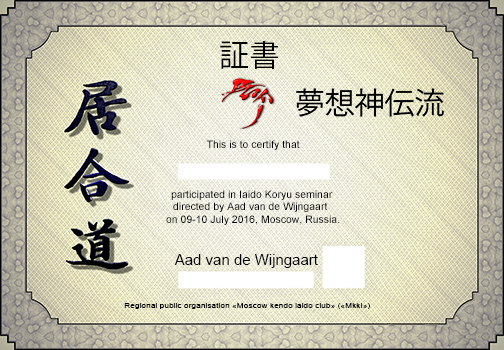 Корю (Muso Shinden Ryu) семинар под руководством Aad van de Wijngaart 12-13.01.2019. Расписание семинара по иаидо 12 января 2019 года. 10.30 – Регистрация заявленных участников на семинар. 13.00 – Тайм брэйк 10 мин. 17.30 – Тайм брэйк 10 мин. Расписание семинара по иаидо 13 января 2019 года. 11.30 – Тайм брэйк 10 мин. 15.00 – Тайм брэйк 10 мин. Формы подачи заявок можно скачать здесь. Заявки принимаются строго до 06 января 2019 года включительно. По всем вопросам участия в семинаре обращаться к Звягинцевой Екатерине admin@iaido.ru, телефон +7(905) 577-20-33. Заинтересованных лиц, просьба обратить внимание на Положение о мероприятии и Договор на участие в мероприятии (публичная оферта). "Muramasa and Masamune were both real swordsmiths known for their legendary blades. They lived in Japan in the 13th and 14th century. According to legend, Masamune was the better smith because his blades were holy. Muramasa's blades were known for blood lust and often considered evil. Any of the swords made by either swordsmith would be effective against legendary creatures such as werewolves, vampires, etc. The legend says that Muramasa challenged Masamune to a contest to see who could make a better sword. After they had both worked for many days and nights on their katanas, they were ready to compete. For the test, they decided to place the swords in a stream with the cutting edge facing up stream. Muramasa's blade was called Juuchi Fuyu, meaning 10,000 Winters. It cut everything that passed, fish, leaves, and the very air that passed over it. Masamune then placed his katana in the stream. Masamune's sword was called Yawaraka-Te, meaning Tender Hands. The blade cut no leaf that passed. The fish swam all around it. The air whistled passed it. Muramasa laughed and mocked Masamune for creating a sword that could cut nothing. Despite Muramasa's mocking, Masamune grabbed the hilt and gently pulled the blade out of the water, wiped it off, and sheathed it. While Murasama was still laughing and mocking Masamune for his lack of swordsmithing skill and for creating such a poor katana, a monk walked over. The monk explained that he had watched the whole contest carefully. He bowed and humbly explained what he had seen. "The first of the swords was by all accounts a fine sword, however it is a blood thirsty, evil blade as it doesn't discriminate as to who or what it will cut. It may just as well be cutting down butterflies as severing heads. The second was by far the finer of the two, as it doesn't needlessly cut that which is innocent and undeserving"(Wikipedia). There are several alternate legends. In some Masamune's sword heals the leaves cut by Muramasa's sword. In other legends both blades cut leaves but the leaves cut by Masamune's blade reform or they split evenly and drift away while Muramasa's sword causes the leaves to just split apart and not reform or the leaves stick to Muramasa's katana. In all accounts Masamune's blades are considered superior not in sharpness or durability, but in control. Masamune's blades are holy and do not cut that which is not evil, while Muramasa's blades will cut anything."